Start your children on the right path with professional firearms safety and marksmanship instruction! This 1 hour private session (for ages 9 to 13) offers your child instruction in both firearm safety and marksmanship skills. Students will have the opportunity shoot several trypes of firearms. Must be chaperoned by a parent or guardian over the age of 21. Chaperones will not be shooting during the class. 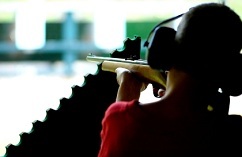 Our patient instructors will encourage your children in the safe handling of firearms. [About MFS instructors] They were extremely helpful. They gave more advanced shooters the fine-tuning they needed and they helped the novices as much as they needed. One example that comes to mind involves an older woman in our class. When we got to the shooting portion of the class she couldn't even squeeze the trigger and was missing every target…Dan patiently explained to her what she needed to do to improve her accuracy…By the end of the class she was hitting every target and doing it much faster than at the beginning of the shooting session. I was extremely impressed.